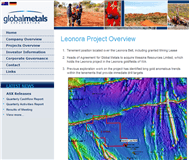 Global Metals Exploration is an Australian Securities Exchange listed gold exploration company with projects in Western Australia, including Jutson Rocks, Mt Venn and the Leonora project. 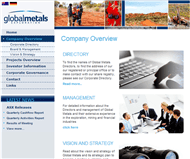 Global Metals aims to create value for their shareholders by advancing their asset base in Western Australia from explorer to developer and producer through an extensive exploration campaign in 2013 and 2014. 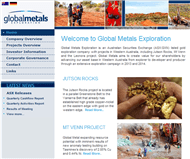 Global Metals is dedicated to systematically exploring the Jutson Rocks Greenstone Belt (“JRGB”) with the aid of modern techniques and expertise in order to provide shareholders leverage to discovery success over one of Australia's last underexplored greenstone belts. The Company's exploration strategy moving forward is predicated on the unique operating environment of the JRGB. With a dearth of previous exploration to build upon and a greenstone belt on the main shrouded beneath a veneer of transported cover (sand), Global Metals is pursuing a comprehensive, contextual and technology driven exploration strategy. 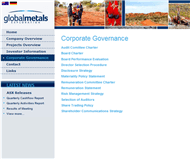 As the first company to consolidate an exploration package across the entire length and breadth of the JRGB, Global Metals is uniquely placed so as to coordinate a comprehensive exploration program. Furthermore, as the exploration industry has been largely precluded from the JRGB, Global Metals will be applying the latest exploration technology to an area at which, for the most part, it has never been applied. Despite the limited exploration work actually completed at Jutson Rocks, the area holds a starring role in the history of Australia exploration when, during the infamous ‘Nickel Boom’ of the early 1970s, speculation over the JRGB sent shares in Tasminex Ltd on a meteoric ascent from $3 per share to $96 per share. While subsequent work failed to justify the heights of this speculative bubble Tasminex did, nonetheless, intersect significant copper and nickel within the Mt Venn region of the JRGB. More recent work by Helix Resources at Mt Venn in 2005, following a 30 year hiatus in exploration, also encountered significant mineralisation including 4 m @ 1.3% Cu interspersed with nickel mineralisation grading 1.2% over an intersection of 2 metres. In addition, the JRGB holds excellent potential for gold discovery as evidenced by the Chapman’s Reward historical gold workings which, according to available records, mined gold ore at an average grade of 54 g/t Au. 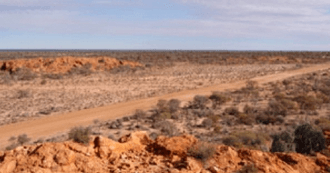 Formed during the Archaean, the Jutson Rocks Greenstone belt is located approximately 125 kilometres north-east of Laverton within the north-eastern region of the Yilgarn Craton. The project is accessible through a bitumen highway to Laverton, followed by approximately 130 kilometres of good quality gravel roads to the Cosmo Newberry aboriginal community, from where secondary tracks provide coverage to the JRGB project areas to the north and south. Situated thus, within the Eastern Goldfields of Western Australia, the JRGB stretches continuously for 60 kilometres in length with an average width of approximately 9 kilometres. Jutson Rocks tracks a pronounced NNW strike and is composed of a broad series of extrusive and intrusive ultramafic, mafic and felsic rocks together with pyroclastics and sediments. The JRGB is circumscribed by regional granitoids while structurally the Greenstone belt is complex, with abundant folding and faulting evident. Generally, there is a transition from the ultramafic dominated terrain in the east through to predominantly felsic rocks and banded iron formations (BIF) in the west. As a greenstone belt the JRGB has been thoroughly metamorphosed into greenschist and amphibolite facies with much of the original igneous and sedimentary texture destroyed. The JRGB is marked by a regional shear zone which runs the entire length of the Greenstone Belt and ranges from 1 to 3 kilometres thick. This shear zone is considered a particularly prospective place for the formation of gold deposits given the presence of gold elsewhere at the JRGB. The presence of komatiite rocks estimated to be up to 4 kilometres thick provide an excellent target for nickel sulphide accumulations. Additionally, there exist mafic sequences throughout the project area which hold good potential for platinum and palladium. Mt Venn Gabbro-PyroxeniteSill, is located on JutsonRocks Greenstone Belt (“JRGB”). This project includes targets worthy of additional exploration, priority being the Tasminex hole area where they have a poorly tested (Helix hole did not intersect the target from the last modelling exercise). Two copper anomalies were identified, one approximately 4km x 0.4km in size named “Venn” and the other approximately 2km x 0.5km in size named “Thatcher”. Strong EM conductor where they know higher grade Cu intercepts were recorded. Two untested VTEM targets along the western contact of the Mt Venn intrusive complex, with the southern one being adjacent to an extensive copper soil anomaly. In addition, subsequent follow-up showed copper mineralisation over two anomalies. Recent resampling of the copper-nickel sulphide have confirmed and improved the base metal results at Mt Venn. Significant mineralised widths outlined below (Based on a 1,000ppm lower cut applied to Cu assay results). The Cu/Ni mineralisation in drill hole MVRC027 of up to 23m in total, suggest potential for the basal layered sequences of the Mt Venn gabbrosill complex to host significant mineralised tonnage potential along strike, for 2km to the north towards drill hole MVRC029 and 2km to the south (towards historic drill hole MVRC020). The proposed acquisition of already drilled gold mineralisation is substantially complete and Global Metals sees great potential to generate an economic project for development.